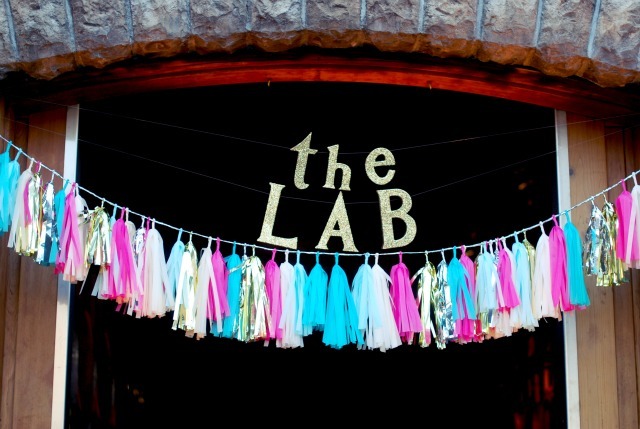 This past weekend I had the pleasure to party it up at The LAB Event! This new offbeat and unique bridal fair did not disappoint. I felt so inspired and even more excited about planning my wedding. 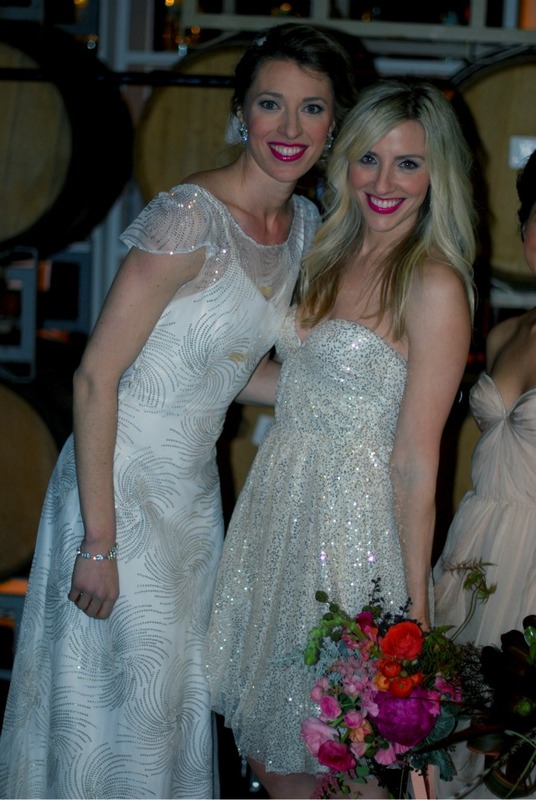 I also got to strut my stuff in a beautiful Sarah Seven dress along with some of my favorite bloggers. 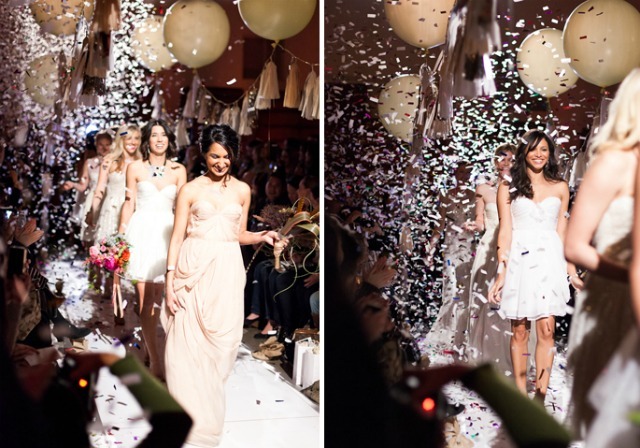 There was even a confetti cannon at the end of the runway show (so fun!). Thank you to Erin, Yasmin, and Allison for creating such a terrific event! lovely pictures and all the dresses are absolutely beautiful! You all look so beautiful. These dresses are amazing. Glad you had lots of fun!! AHHH you are all so beautiful!! I'm excited to see future wedding update posts! I know it's going to be stunning! nice dresses. you have a really good eye for stuff... kinna jealous. haha..
Looks like such a cool event!!! Sorry I missed this - looks like a ton of fun! Lucky you for getting to twirl around around in that gorgeous dress! looks like so much fun! all the dresses are gorgeous! Sounds a magical event! Loved the dress you were wearing - loved! Awwww. Love bridal. I'm an eternal romantic. And how pretty you look that night! Love the dress and the lipstick. wooooooow what an amazing event. the place looked so fairytale like...LOVE IT!!! and you and the other lovely ladies looked soooo gorgeous!! Two words. confetti. canon. Nothing else need to be said. Awesome. 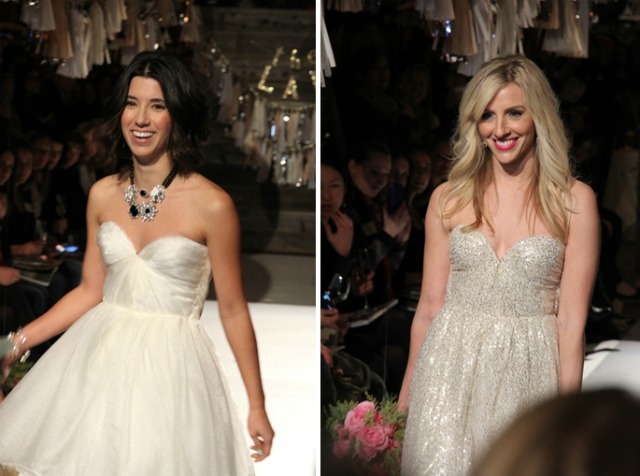 love the sparkle of your dress; nothing quite like strutting and preening down a runway to boost your confidence! Rockin' that Pink Poodle gloss! We loved doing your makeup and hair for the event! I want to COMPLETELY transform a room for a wedding reception. I belong to a country club and there are the most beautiful halls and it would mean so much to my parents if I had a reception there. The rooms are amazing and better than anything I could afford for myself, its just that lots a lot of people I grew up with, who also belong to the club, have receptions there. Is there a way to tent a room, or completely change the decor (I have free range, they'll cater to me completely) to make it feel like a different room? I want whimsy like the LAB event, and a romantic feel. OMG so much pretty going on here!!!! Wish this was around when I was planning my wedding! It looks amazing - so many of you wonderful bloggers are getting married this year! wow! so lovely! love the cut of your dress! how fun! you look so cute! I love the dress you're wearing Taylor, and it looks like and sounds like you had so much fun! aww those pictures are adorable - they look like they should be in a magazine. Yall are all so stinkin adorable! Taylor, you look GORGEOUS! I love this dress on you -- it's so fun and sparkly. this looks like heaven! that dress looks AMAZING on you, btw. What a fun night! This looks like so much fun! Your dress is beautiful too. Aww you look beautiful! Looks like a successful event. 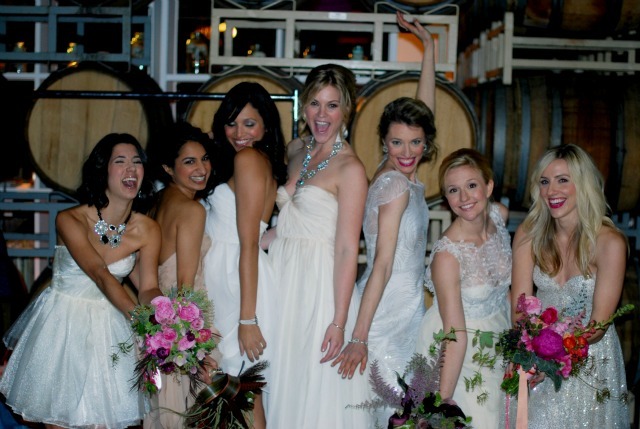 It looks like a huge bridal party, so fun! wow everyone looked so beautiful! WOW! That looks like such an incredible and unique event! All of you ladies look gorgeous...How fun! You looked great, and I love the pink decorative tassle hangings. These pictures make me happy 2! I've been ultra slacking with the blogging & commenting lately :( but you look as gorgeous as ever and these photos are looovely, Taylor! I love the bright pink lipstick you girls are rocking, what is the brand and color name?